Omega-3 fatty acids provide many health benefits, from reducing cardiovascular disease to improving mental health, and consumer interest in foods enriched with omega-3 fatty acids is increasing. Formulating a product enriched with these fatty acids that is stable and has an acceptable flavour is challenging. 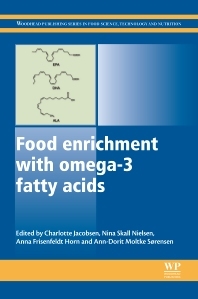 Food enrichment with omega-3 fatty acids provides an overview of key topics in this area. Part one, an introductory section, reviews sources of omega-3 fatty acids and their health benefits. Chapters in part two explore the stabilisation of both fish oil itself and foods enriched with omega-3 fatty acids. Part three focuses on the fortification of different types of foods and beverages with omega-3 fatty acids, including meat products, by the modification of animal diets and other methods, infant formula and baked goods. Finally, part four highlights new directions in the field and discusses algal oil as a source of omega-3 fatty acids and labelling and claims in foods containing omega-3 fatty acids. Food enrichment with omega-3 fatty acids is a standard reference for professionals in the functional foods industry involved with research, development and quality assessment and for researchers in academia interested in food lipids, oxidation and functional foods. Charlotte Jacobsen, Ph.D., is professor with special responsibilities in lipids and oxidation in foods. She leads the research group for Bioactives—Analysis and Application at the National Food Institute, Technical University of Denmark. She obtained her M.Sc. in 1990 and her Ph.d. in 1999, both from the Technical University of Denmark (DTU). During the last 20 years she has carried out research in the area of oxidative stability of foods enriched with functional lipids including omega-3 enriched foods. She is internationally renowned for her research in this area and she has received several awards for her work including the Danish Danisco price 2003 (40.000 $), the French La Médaille Chevreul 2010 awarded by Association Francaise pour l’étude des Corps Gras as well as two best paper awards from the American Oil Chemist’s society. She was appointed by EFSA as an expert in the Fish Oil working group under the Biohazard Panel to evaluate the potential hazard associated with human intake of refined fish oil. Her publication list includes more than 130 peer-reviewed manuscripts and book chapters. Her research group collaborates with several large national and international companies such as Arla Foods (DK), Pronova (Norway), EPAX (Norway), Dupont (DK/US) and Glaxo Smith Kline (US/UK). Nina Skall Nielsen works at the National Food Institute, Technical University of Denmark (DTU), Denmark. Anna Frisenfeldt Horn works at the National Food Institute, Technical University of Denmark (DTU), Denmark. Ann-Dorit Moltke Sørensen works at the National Food Institute, Technical University of Denmark (DTU), Denmark.